3. Green Chilly medium sized 4 in nos. 6. Brown Bread Crumbs (I had grinded normal brown bread 3 in nos. with roasted peanut). Also pls remove its corners. 1. 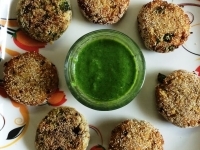 Mix all ingredients and make cutlets in any shape (round, oval, heart shaped). 2. Coat well in suji(semolina). 3. Deep fry or roast on a non-stick pan. Can also brush with oil and bake in a non-stick or OTG.